Here we have some of the best sky or cloud formations imaginable. These where all luckily caught on camera and shared with the rest of the world. There’s these wonderful UFO shaped clouds and then there’s the total opposite to a UFO formation in the clouds – or should I say literally the opposite, you’ll see what I mean. I can see a round hole right at the very bottom of this that look’s like a port hole or a hidden light? I explain more what I see further on in the post. I mean, it’s just a hole or should I say a hole and a half, but what the heck could of made this? It’s like there’s something there, but what as it’s invisible and we all know that some huge corporations with secret trillions of dollars in R and D funds are very capable of creating such a machine, device or ship that could create this with it’s shape. You can bet the house on that. This is like a mothership from a scifi movie trying it’s hardest to look invisible (if there’s such a thing) as everyone looks up but can’t see anything. Now that’s a conundrum because we know it’s there but can’t see it and that’s why it’s weird. Here’s the Moscow skyline UFO caught on camera. This is just fantastic for all the right reasons as there’s a dark line going around the lower part of the “fallstreak” which gives this cloud shape definition and that’s why this could be a cloaking device. This look’s intelligently made, I’m sorry but clouds DO NOT have port holes and or lines going round the thing to give it definition. That’s why I wanted to feature this and that’s why I need your help in establishing what the heck this is? I’ve never seen a cloud either in real life like this or online before, have you? It is my determination that we’re looking at something definitely intelligently made here as this has all the hallmarks of a UFO hiding in plain sight? It is fascinating, weird and probably stealth with an invisibility cloak around it and as I’ve done over 1250 videos on conspiracies, I know a thing or two about this type of technology I say technology because it’s real. The military has been working on this type of materials for a long time. It’s materials as some of the first ever produced stealth invisible cloaks were clothing. Apply this to a gravity defying craft and you have a cloaking device around a craft making it invisible. It is not invisible in the traditional meaning of the word more blending in with the background. That’s why it look’s like a cloud. It’s doing the famous magicians trick “now you see me now you don’t” dance or routine, well sort of. So, as I was trying to think of what the opposite to this hole in the cloud could be or actually “is” so I looked it up and it stands to reason that it’s a *Fallstreak. It’s a *Skypunch. It’s a *Cavum. It’s a Hole Punch Cloud! I mean that was obvious, NOT. Who gives these things names like that? Check out the Wiki page for it and you’ll be amazed at how many names there are for these weird (it only need’s one name and that’s weird) right. I kid you not! 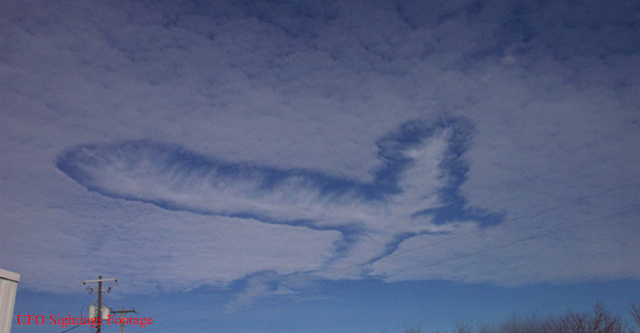 There’s an actual Wikipedia page dedicated to these rare cloud formations. Now this is what they mean buy when they say that “not everything that’s rare is worth money”. Maybe that’s what they mean, probably not. I think that refers to my old shoes, one of a kind-ish. Now they are. As you can imagine some religious people are taking this as a sign of things to come? Some are seeing this as a sign that God is with us all the time. There’s obviously some people that think it’s the end of the world but personally I think this is just a Fallstreak Cross cloud formation. Sometimes I can actually make out the shape of a Rabbit, does that mean it’s going to rain carrots or Rabbits for that matter? 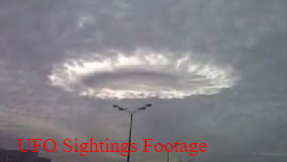 Please check out this website post with more spectacular and amazing all natural cloud formations, the one above happened in Nelson County, Virginia, US. A fallstreak hole (also known as a cavum, hole punch cloud, punch hole cloud, skypunch, cloud canal or cloud hole) is a large gap, usually circular or elliptical, that can appear in cirrocumulus or altocumulus clouds. 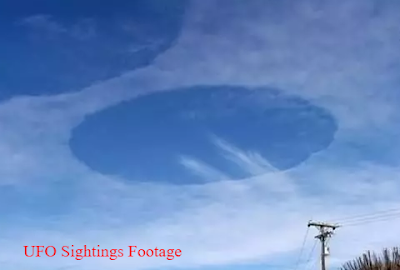 Such holes are formed when the water temperature in the clouds is below freezing but the water, in a supercooled state, has not frozen yet due to the lack of ice nucleation. When ice crystals do form, a domino effect is set off due to the Bergeron process, causing the water droplets around the crystals to evaporate: this leaves a large, often circular, hole in the cloud.